If you were a team holding onto a defensive asset hoping the Toronto Maple Leafs would come calling at the trade deadline, one of your biggest targets may have just been knocked out of the lineup. Andreas Johnsson, one of the Maple Leafs’ young forwards that has speculated as a potential trade chip this season has been ruled out of Wednesday’s action with a concussion suffered in last night’s game against the Arizona Coyotes. Johnsson was hit by Niklas Hjalmarsson in the corner and did not return to the game. Johnsson, 24, is in his first full season in the NHL after winning the Calder Cup playoff MVP last year. The Swedish forward has 22 points in 43 games while bouncing up and down the lineup, seeing time beside Auston Matthews of late. TSN’s Frank Seravalli had recently listed Johnsson at #24 on his Trade Bait board, just behind fellow Maple Leafs forward Kasperi Kapanen. Both players are pending restricted free agents and could be cut loose given Toronto’s upcoming cap crunch. For now though, the Maple Leafs will have to operate without Johnsson in the lineup and find out a way to get back on the right track. The team has lost four of five games and is loosening their grasp on the second spot in the Atlantic Division. If that sparks action in the front office, it’s unclear whether they would be able to get full value for Johnsson now that he is out indefinitely with the second reported concussion of his North American career. Dumba, 24, has been on fire through the first two months of the season, recording 12 goals and 22 points through 32 games. That outstanding start comes on the heels of a career-high 50-point campaign in 2017-18, one that put Dumba on the map as an all-around offensive force from the blue line. Armed with a lethal point shot from the day he entered the league, the seventh-overall pick from 2012 has improved his breakouts and creativity through the neutral zone. Losing him would leave a big hole on the right side for the Wild, who are fighting to stay relevant in the Central Division playoff race. Missed in the Toronto Maple Leafs annihilation of the Florida Panthers last night was the loss of Zach Hyman, ruled out before the game due to an ankle injury suffered earlier this week. 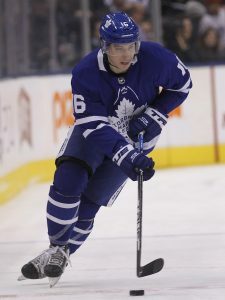 The team quietly revealed that Hyman will be out for at least three weeks, leaving the Maple Leafs searching for another forward to fill his spot next to John Tavares and Mitch Marner. Andreas Johnsson was that lucky forward last night, but it’s not clear if the role will be his for the entire three weeks. It won’t be just Matt Duchene that returns for the Ottawa Senators tonight, as Dylan DeMelo has also been activated off injured reserve and will be in the lineup when the team takes on the New Jersey Devils. DeMelo hasn’t played since December 8th, and was just starting to really come into his own for the Senators. After averaging just over 18 minutes a night through his first 20 games for the team, DeMelo had recently seen that number jump to almost 21 and a half per game while holding down added responsibilities. The 25-year old was part of the package received for Erik Karlsson from the San Jose Sharks, and could potentially be a trade deadline target given his extremely inexpensive contract. DeMelo carries just a $900K cap hit through next season.